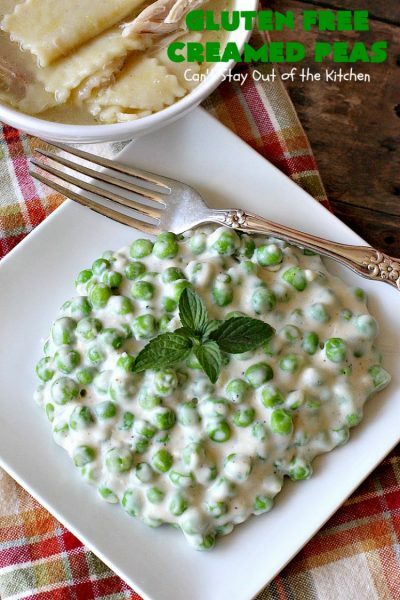 Gluten Free Creamed Peas are delightful. This satisfying side dish takes only about 10 minutes to prepare. That makes it really easy for holidays, special occasions or even regular family meals. 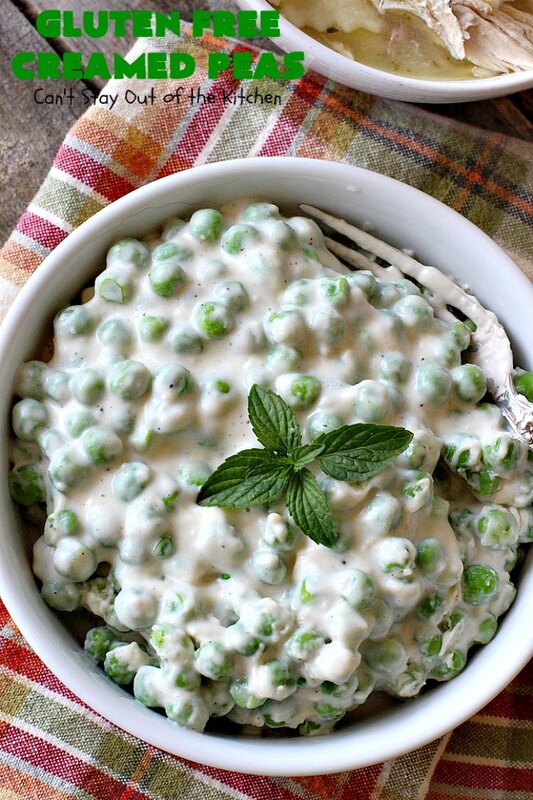 I used gluten free flour to change up a favorite way to make Creamed Peas. 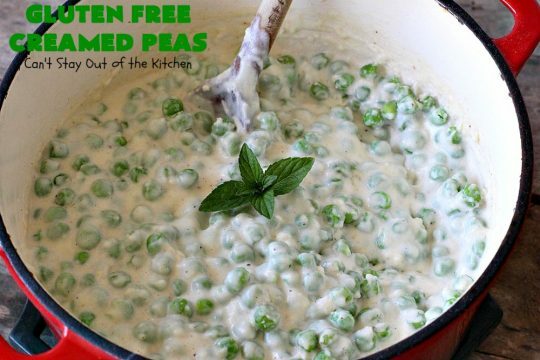 But these Gluten Free Creamed Peas are different from your average Creamed Peas Casserole. This side dish has a little kick because it uses Creole Seasoning to gin up the flavors a little. 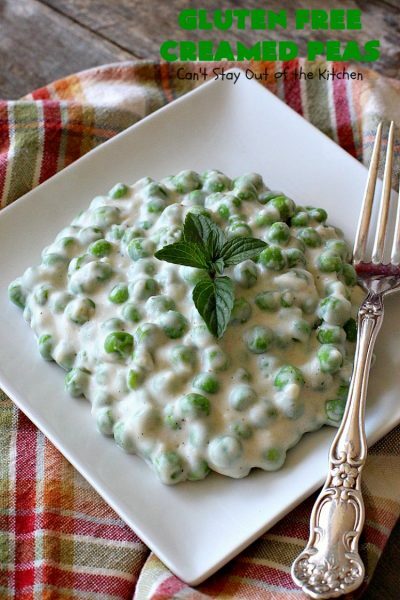 This side dish is especially nice to make if you have a lot of peas on hand that you’re trying to use up. 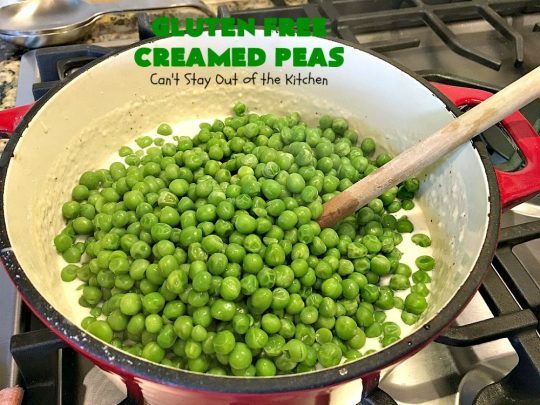 I used frozen peas, but fresh peas can be substituted if you desire. You can use regular flour if you’re not concerned about gluten intolerance. The seasonings can be adjusted to your family’s needs. Also, the half-and-half can be increased if you prefer a thinner sauce. It’s tremendously versatile and one of those recipes you can easily experiment with, too. I served it with Homemade Chicken and Dumplings for our weekly Friday night Bible study and care group meal back in May. That was one of those stick-to-the-ribs comfort meals that everyone loved. I recommend serving this dish any time you need a quick side dish. 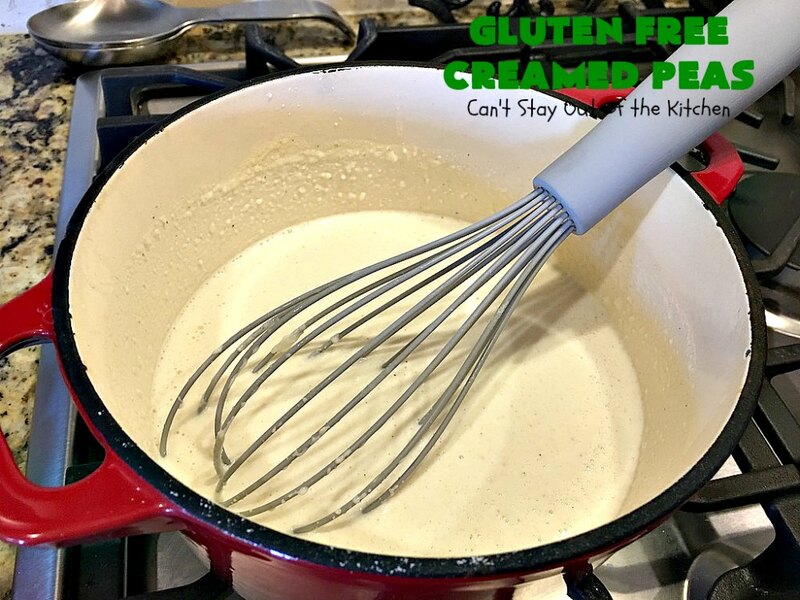 You can whip it up in a jiffy, so it’s also great for when unexpected company stops by and you need to throw something together quickly. Back in April, we had dinner with some folks from our neighborhood. They treated us to a meal fit for kings and queens! When I asked for recipes, Linda allowed me to borrow her self-published cookbook. Her version of this recipe was in that cookbook. 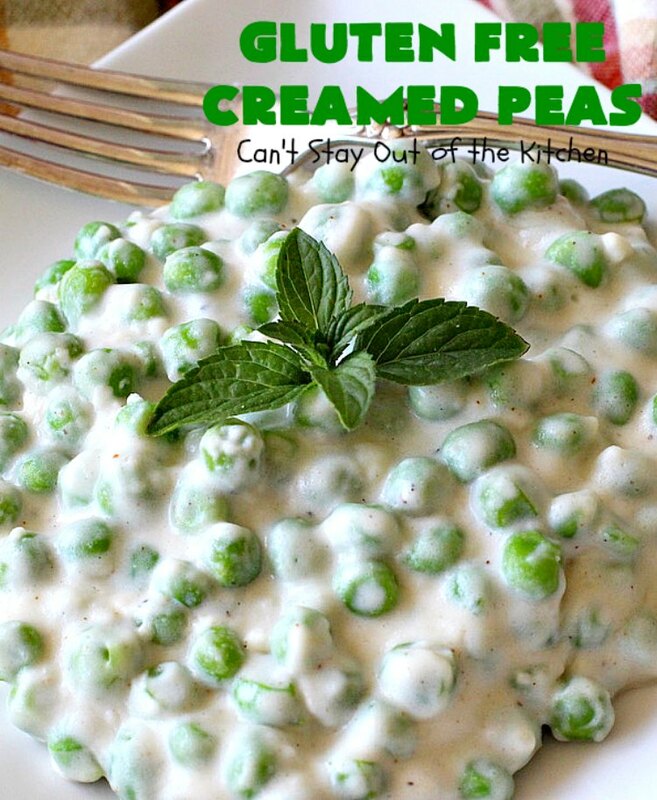 She used canned English peas and canned milk, so obviously those can be used as well. I prefer the taste of frozen versus canned peas, and half-and-half versus canned evaporated milk. Gluten Free Creamed Peas are a quick and easy side dish for any dinner meal. I served Gluten Free Creamed Peas with Homemade Chicken and Dumplings. 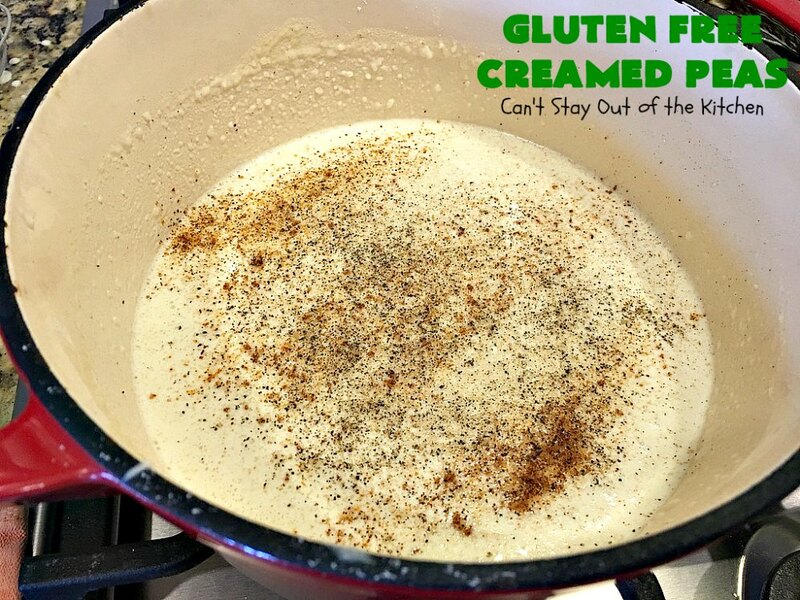 The thick and creamy sauce is spiced up with a little Creole seasoning. I used these ingredients. 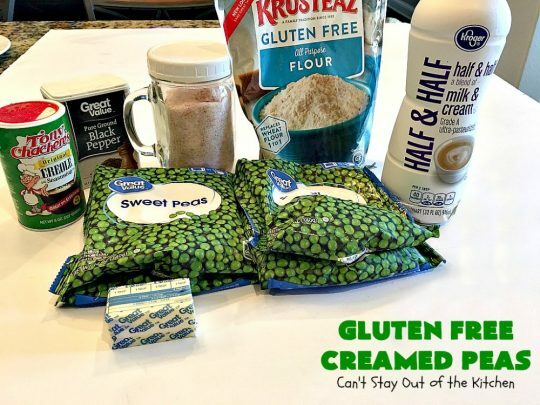 However, I don’t recommend Krusteaz gluten free flour for this recipe. That works better for cakes and baked goods. I recommend using Bob’s Red Mill all-purpose flour instead. Melt butter in a small saucepan over medium heat. Add gluten free flour and whisk to combine. Add half-and-half a few tablespoonfuls at a time and whisk until fully incorporated and no lumps remain. Allow the sauce to heat and thicken a minute or two. Add salt, pepper and Creole seasoning. Stir to combine. Meanwhile, microwave peas on high heat about 5 minutes. Drain, if necessary. Stir to combine. Heat through. Check seasonings. Add additional salt, pepper and Tony’s Creole Seasoning, if desired. Remove from heat and serve. If you like the sauce a little thinner you can add additional half-and-half at the end after the sauce has thickened. 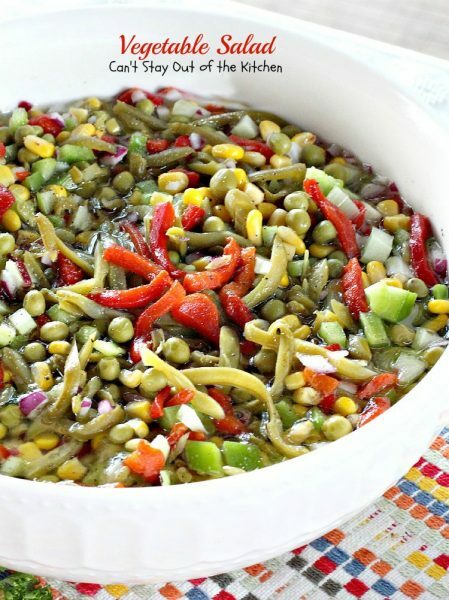 This side dish is so quick and easy to make. If you need a gluten free side dish in a jiffy, this is it! 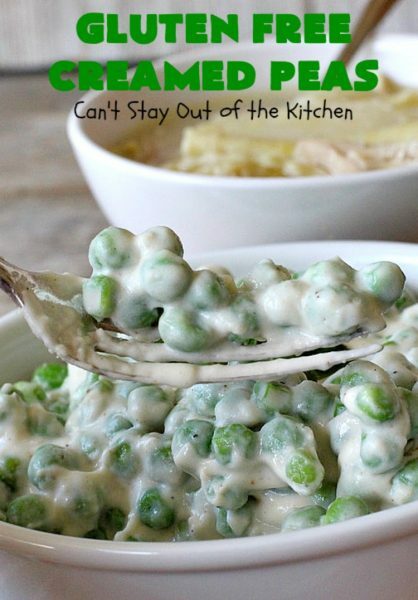 Gluten Free Creamed Peas was perfect along side Homemade Chicken and Dumplings. 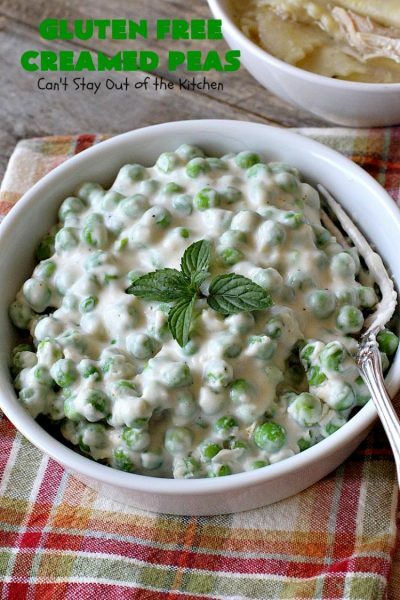 This tempting side dish is a delicious and creative way to serve peas. It's amped up with Tony's Creole Seasoning for increased flavor. This recipe takes about 10 minutes to make so it's a terrific side dish for company or holiday meals. Gluten free. Microwave peas over high heat about 5 minutes. 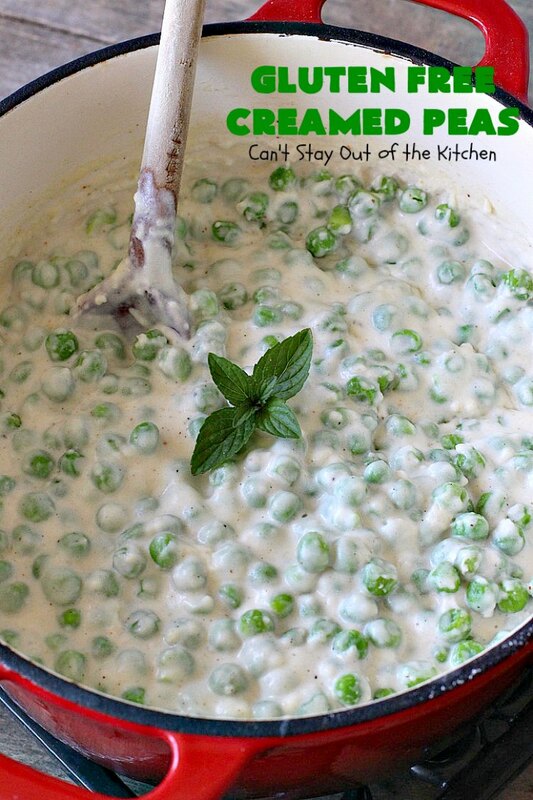 Make a white sauce by melting butter in a saucepan. Stir in gluten free flour, salt, pepper and Tony’s Creole seasoning. 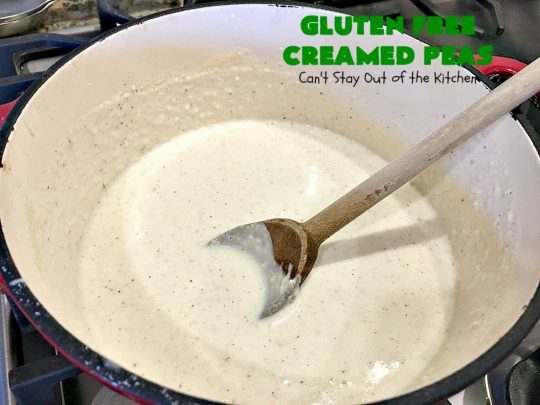 Add half-and-half cream and heat until you have a medium white sauce. Add additional salt, pepper or Tony’s Creole Seasoning if desired. 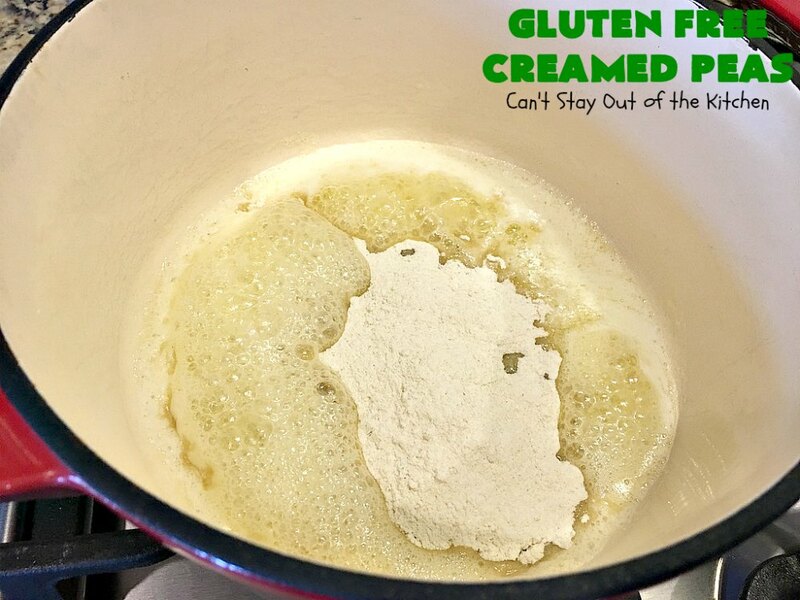 NOTE: You can use regular flour for this recipe. Adjust the half-and-half to the thickness of the sauce you desire. (More if you want a thinner sauce, less if you want a thicker sauce). 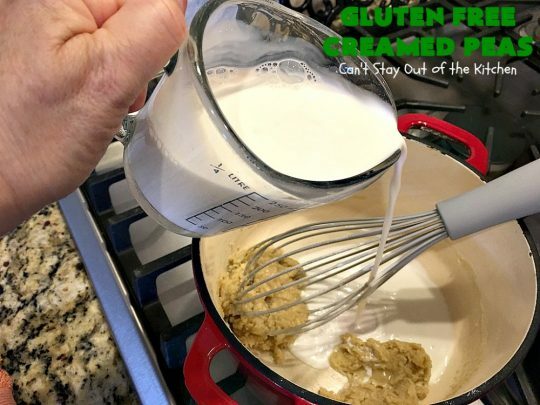 NOTE: I recommend Bob's Red Mill brand gluten free flour for this recipe. The GF Crusteaz flour works better for baked goods, not for sauces. I love quick and easy recipes and Gluten Free Creamed Peas is one of them. The sauce tends to thicken as it sits out so you may want to add additional half-and-half to thin it down a little.